RFA players, please use Arcade difficulty. Please indicate which MAME build and program version you may have used. To use a Slave, highlight the ship of the Slave you want to use, then hold a direction and press A+B+START. 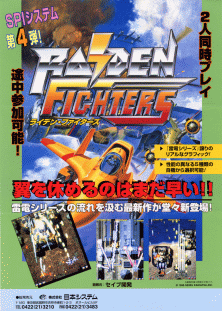 Note that all region releases of Raiden Fighters Aces contain the Japanese version of each game. 3. Raiden Fighters 2 - 49,228,760 - ALL - ------------- - ? 5. raiden - 4,490,470 - 3 - ------------- - ? 7. Twiddle - 43,816,300 - ALL - (Judge Spear) - ?? - ? 11. Battletoad - 14,493,070 - 4 - (Chaser) - Yes - ShmupMAME v3.0? 1. -M- - 101,048,370 - ALL - (Judge Spear) - ? - ? 2. pugeta - 21,382,470 - 1-6 - (Judge Spear) - ? - ? 1. sht_ycw79 - 106,241,370 - ALL - (Judge Spear) - ? - ? 2. Twiddle - 91,726,680 - ALL - (Judge Spear) - ? - ? Last edited by Despatche on Thu Jan 24, 2019 6:44 am, edited 35 times in total. Wow! Despite dropping a medal on stage 5, screwing up my bomb placement on stage 6, and outright killing fairies on stage 7, I managed to squeeze out a score of 50 million. Last edited by Kyper on Tue Feb 05, 2013 12:21 pm, edited 1 time in total. Kyper has double entry on the Japan board standard ship score. The 2nd 1cc is recorded with this score. I'll upload it to YT once I got my internet connection back. Considerable improvement, but still dosen't move me one place. Been playing in prep for possible Week 1 STGT! Keep it up! My videos or even SFKhoa's or DAB's on Youtube should help you! shmuppyLove: You should practise the J version. That'll be the version we play in STGT. How do I activate x-medals? I've got 2 slaves, medals at 9000, flew over a miclus. Nothing happened. Before grabbing your first slave, get at least 8 medals (80 points). Get your first slave, then get at least 8 more medals (800 points). Get your second slave, then keep grabbing medals until you see the big gold one (10000). Now reveal 9 gold medals on the screen at once (a miclus does the job just fine). They should explode, and allow medal points to climb up to 100000. Is there any difference between the set 1 and set 2 releases of the Japan version of Raiden Fighters? If I may examine the versions, there are no certain differences between the two. Hmm, that's what I thought. I stuck with Set 1 for this and Set 2 for RF2 I believe. Didn't quite reach my intermediate 15M score goal, but considering it was the only time I passed the first mission out of the batch, I'll take it. lol at where I died. Gotta figure that out again. Silly fun facts: I had no progress in survival during a batch of plays this morning, but I did get a few Fairies in the forest stage beginning (after the quickshot bombers). Now I'm back to not being able to quite pull that off (one or two bombers will just barely get shots off). I got a few "Destroyed at a time!" bonuses from bombing destroyers on this run, which I normally don't do. Did a little searching around, but couldn't find anything stating the difference between US and Japan boards. What's the reason for the separate leaderboards? Just curious. I know in RF2, the US version loops, and the JP version does not. Might be the same for RF1. Should be the same as the other games; US board has loops and the Miclus appearance timers are longer. By the way, I really appreciate the use of something that isn't just Judge Spear or a Slave. I really want to split the boards by ship, but there are way too many of them (especially for RF2) and not nearly enough interest. Does anyone know how to select the Slave on the 360 version of this awesome game? The score was done on Normal diff. on the port. The opening post says to play on "Normal", but it's probably referring to the PCB settings, right? Does Normal diff. on the PCB equal to Arcade diff. on the port? If yes, ignore my score. I even failed at selecting the slave ships in the Arcade version. Seems like you need to push each of the four buttons like exactly simultaneous. Only worked after I set them all to one button. I'm at 6 million up to stage 3 after a few credits, having a hard time getting to those 100k medals. But it'll work out in time. Definitely an awesome game. This was done on Arcade difficulty. This is a fantastic game on shmupmame. Thought I'd have a go at scoring. The walkthru posted is excellent. Up to 1.5m on Judgment Spear but will post a score when I get nearer the 3m mark. A quick question. When playing in tate the background floor wobbles a bit. What can I do in the settings to stop this artifact? That's a shmupmame artifact. That's how it reduces lag by a frame. Nothing you can do aside from just not using shmupmame. Aha. Well I can live with it. Reached stage 7 and died after three seconds.